The Olympic Winter Games PyeongChang 2018 are fast approaching and I’m hosting an opening ceremony party on February 9th with some of my girlfriends (yes, we make any excuse to gather over good food, good friends, and a glass of wine). But life has been crazy hectic recently so I know it’s going to be a rush to get the house ready in time. 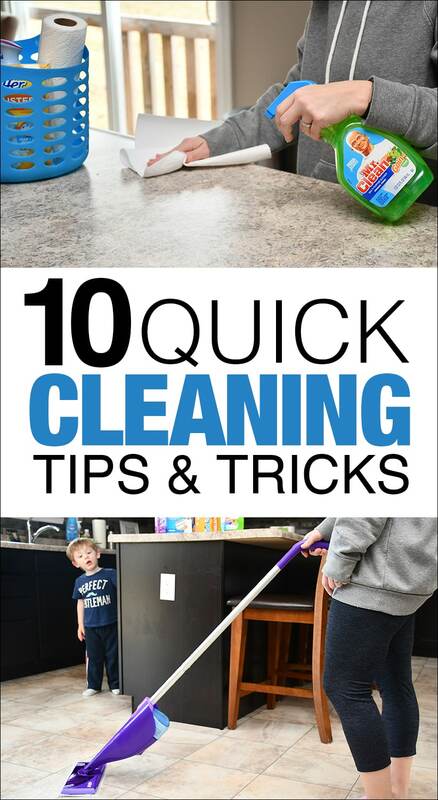 I thought today I would share my 10 Quick Cleaning Tips Before Hosting a Party so you guys know how I get my house in order before I host an event plus how I keep my home looking fresh and clean everyday! 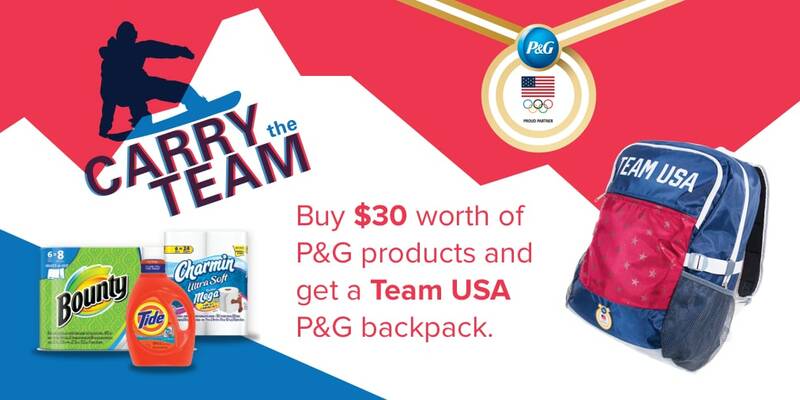 And with the great selection of products from P&G (Team USA partner for The Olympic Winter Games PyeongChang 2018) available at Schnucks stores all over St. Louis, you’ll be armed with all the essentials including all the food and festive decor you need to throw an amazing party all your friends will love! 1. INVEST IN A CLEANING CADDY. 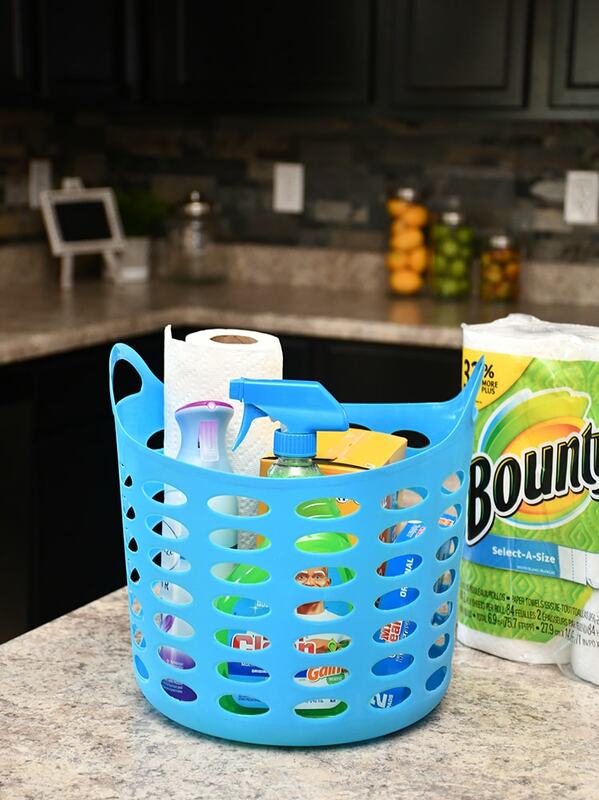 One of the best tips I can give you is to invest in a cleaning caddy, a little container or basket to store all of your cleaning supplies that’s easy to tote around the house. 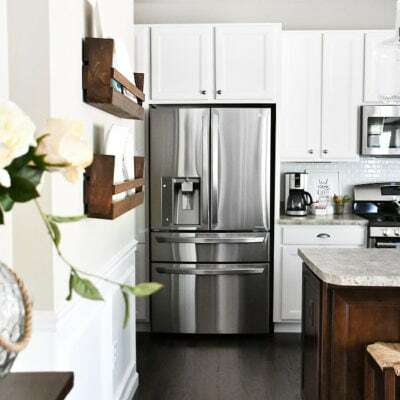 This way you won’t be running around searching for your cleaning supplies when you switch from your kitchen to the living room to the bathrooms, etc. 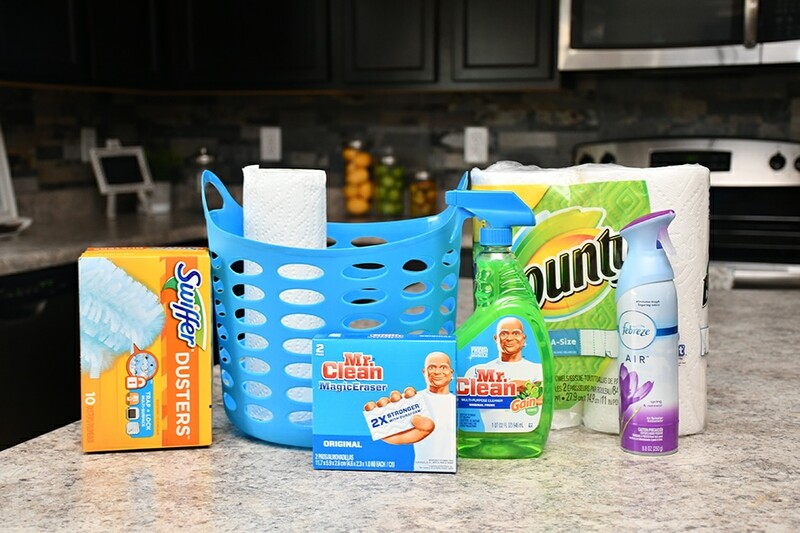 Also it will really help you organize and reduce the number of cleaning products you use in your home when you have a set container space you can fill. 2. USE MULTI USE CLEANING PRODUCTS. 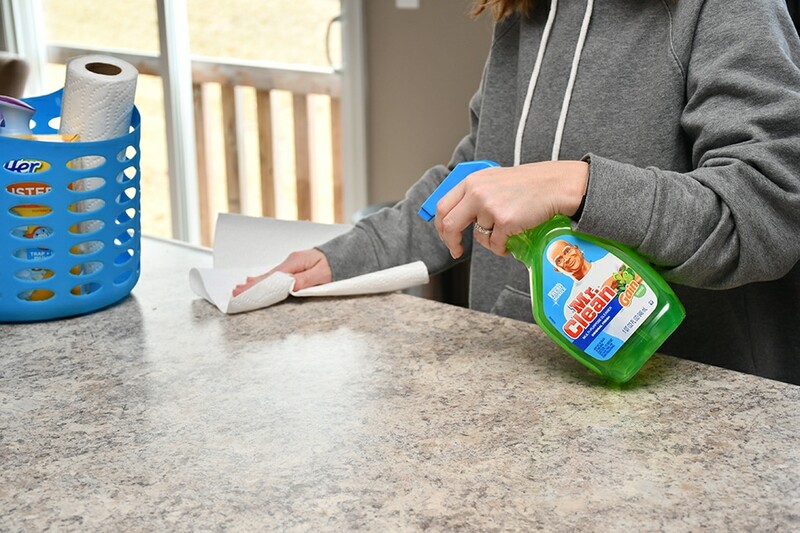 One of the best quick cleaning tips I can give you is to use one amazing product to clean all of the main areas in your home. I prefer to use Mr. Clean’s Multi-Surface Cleaning Spray. It cuts through grease and grime on toilets, tubs, showers, sinks, counters, floors, stoves and more, leaving nothing but a fresh lemony scent. I also love the Swiffer® Dust & Shine Multi Purpose Spray for granite, wood, leather and marble and Mr. Clean Magic Erasers for door, light switches, and walls. Yep, multi use cleaning products are your new best friends. 3. WORK YOUR WAY FROM TOP TO BOTTOM. My mom taught me this tip when I was growing up and it’s always stuck in the back of my mind. 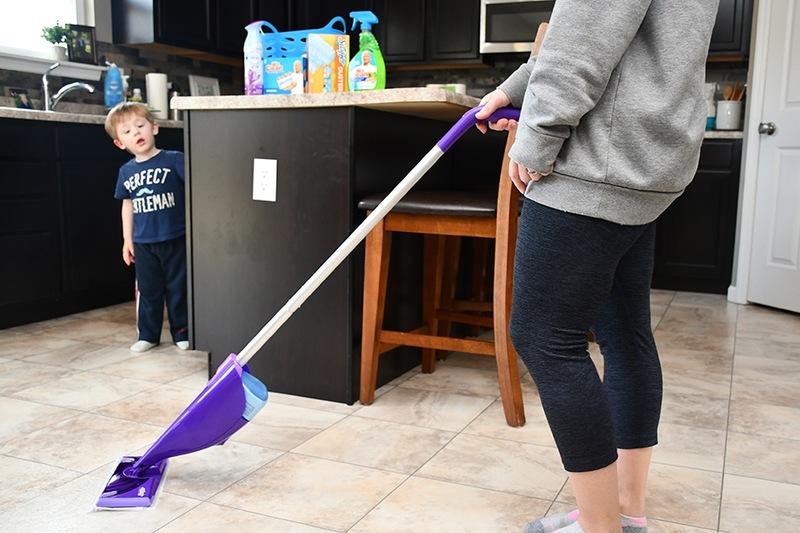 If you’re going to be dusting furniture or cleaning the kitchen counters, crumbs and dust will end up on the floor… hello gravity. So the best tip is to start at the top and work your way down, ultimately saving the floors for last. I think dusting is sometimes underrated. I hate walking into homes and seeing a thick line of film on end tables, ceiling fans, HVAC returns, and baseboards. 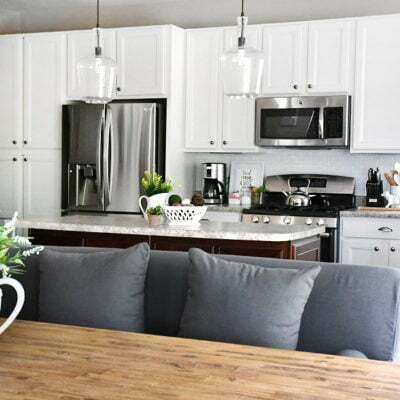 While this normally isn’t part of a “quick clean”, think about knocking out those extra items while you’re moving from room to room dusting your normal furniture. It only takes a few quick minutes to go the extra mile! 5. SPEND MOST OF YOUR TIME IN THE KITCHEN. At parties we always seem to gravitate towards the kitchen and end up gathering around the kitchen island so of course that’s where I spend most of my time cleaning. First of all, do the dishes. Don’t let your friends walk into a kitchen with a sink full of dirty dishes. No one wants to see that. Also wipe down your kitchen appliances. Get rid of those sticky fingerprints all over your refrigerator, stove, dishwasher and microwave. Also declutter the kitchen counters and then wipe them all down. 6. PACK A BASKET WHILE YOU DECLUTTER. Another one of my favorite quick cleaning tips is to keep a basket at the bottom of the stairs while you’re cleaning (or in a main living space if you live in a one story home). While you’re decluttering each room, throw the items into the basket. Doesn’t even matter if it’s mail that you haven’t gotten to yet or a kid’s toy, just throw it in the basket… you can get to it later. Focus on the quick clean for now, organize later. 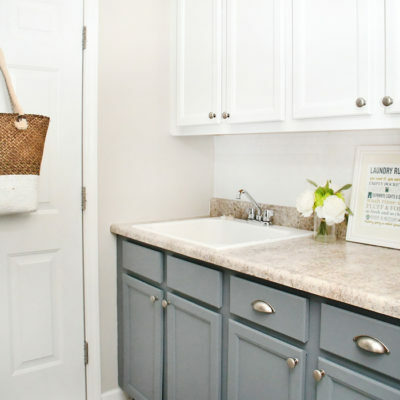 Then just minutes before your guests arrive, take the basket to the master bedroom. We just use an empty plastic laundry hamper usually, but we use this idea all the time! 7. QUICK CLEAN THE BATHROOMS. I know… this part is no fun. But no guest wants to see a ring around the toilet or soap scum all over the faucet. For the quick clean, focus on that one multi use product like Mr. Clean’s Multi-Surface Cleaning Spray with Lemon so you can breeze through the bathroom fast. I also keep a roll of Bounty Paper Towels under each bathroom sink to easily wipe up messes. If you have a two story home, you can easily make the upstairs off limits… usually. 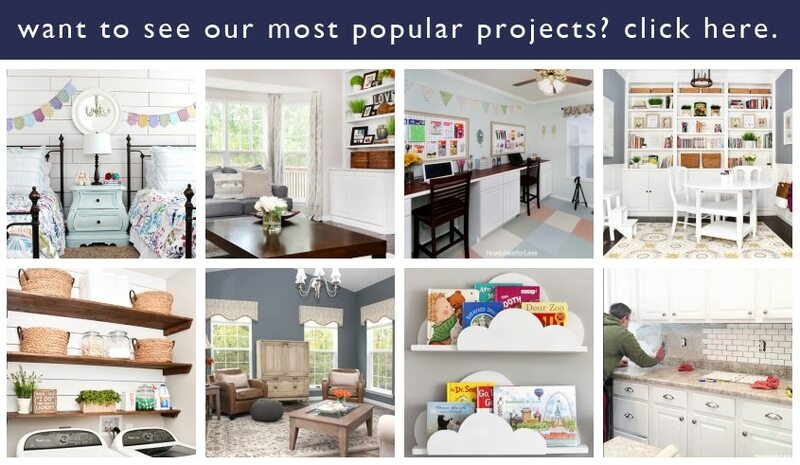 But it’s much harder to hide the bedrooms in a one story home when you’re entertaining guest. The best way to make your bedrooms look clean is to simply make the beds. You can also throw any other miscellaneous items in baskets, drawers, closets, whatever… you’re secret is safe with me. Just focus on the bed for a quick clean of the space. Alright folks, you’re almost in the home stretch. You’ve dusted, scrubbed the bathrooms, made the beds, cleaned the kitchen… now it’s time for the floors. Vacuum everything and then mop the floors. The Swiffer® WetJet™ is good for quick cleans. The cleaning solution loosens dirt and lifts it off the floor, pulling dirt and grime into the WetJet pad and locking it away for good. 10. MAKE YOUR HOME SMELL FABULOUS. I just love how my home smells when I’ve cleaned it just before a party. A clean home usually smells clean, right?! But if you have a pet or have been cooking funky smelling foods all day in preparation for the party, sometimes the cleaning smell disappears too quickly. A little trick before your guests arrive… Febreze. Use in your kitchen, bathroom, living room… anywhere odors are lingering in the air or you simply need an instant burst of freshness. 10 Quick Cleaning Tips Before Hosting a Party! Olympic Winter Games PyeongChang 2018 party? Whether it’s using a Swiffer for a quick clean before friends and family stop by, or grabbing Bounty paper towels to wipe up drink spills, P&G has everything you need to create a gold medal worthy party – from start to finish! And Schnucks is a great place to shop for everything you need for a party including festive decor and your favorite foods, including fresh produce and the fresh new prices that are lowered on everyday items!